The Jiffy J-2000 continues to reign as the most effective, easiest-to-use full-size clothes steamer. 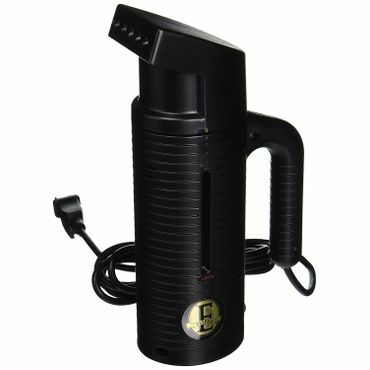 For occasional use, the Jiffy Esteam produces the longest steam time among handheld models. For a terrific travel steamer, we suggest you tuck the Conair Travel Smart Garment Steamer into your bag for de-wrinkling on the go. Reviewers say the J-2000 Jiffy Garment Steamer is well-built, easy to use and performs very well not only on clothing, but other household items as well. It heats up in minutes and can steam for 1.5 hours on a single fill-up. It's a particularly good choice for those who make costumes or otherwise do a lot of sewing. For those who don't need a full-size steamer, but like the convenience of steaming clothes, draperies and more, the Jiffy Esteam Personal Handheld Steamer is a lightweight, simple solution. The Esteem heats quickly and produces about 15 minutes per steam per fill. When not in use, it stows away easily in a cupboard or drawer. The Conair Travel Smart Garment Steamer weighs just one pound and has a folding handle, making it a great choice for travel since it takes up little room in a suitcase. The Conair heats up quickly and can steam continuously for about 10 minutes. The Travel Smart includes a storage pouch, and has dual voltage compatibility for international use. Don't like to iron, but also don't want to look like you just rolled out of bed? A garment steamer might be the answer. They're quick, easy to use and offer a smooth, pressed look -- taking just minutes to steam away the wrinkles in your clothes -- without the hassle of setting up an iron and ironing board. They can also serve to freshen clothes between trips to the dry cleaner, thus saving money on dry cleaning costs. 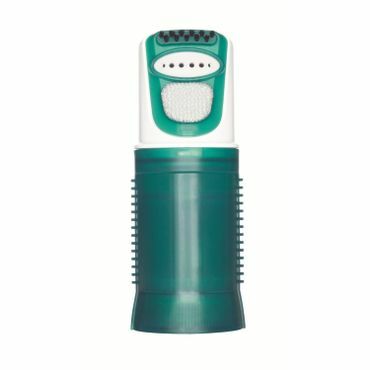 Garment steamers can also be used on items other than clothing. Window and shower curtains, drapes, wrinkly bed skirts and more can easily be spruced up using a garment steamer. Unlike an iron, garment steamers can be used on delicate fabrics like velvet and silk. We read a number of reviews from owners who say they use a handheld steamer exclusively and some who say they've replaced their iron with a compact steamer. Full-size standing garment steamers resemble canister vacuums, with a water tank that is connected to a steam nozzle with a long hose. They are very popular with those who sew a lot, costumers and crafters. Most upright steamers have a built-in rack or hanger for hanging clothes while steaming them, which makes them tall. That's something to keep in mind when planning for storage -- although in most cases the rack is removable or folds down. Still, full-sized garment steamers do take up a bit of storage space. Upright floor models usually have caster-type wheels that make it easy to move them from room to room. This type of garment steamers is the most common type in most homes. These resemble a pitcher, with a nozzle in place of the spout. Handheld steamers are useful for lighter duty jobs and quick touch-ups, and are great for keeping your draperies and curtains looking fresh, but will require refills more often. They are also easy to store, taking up very little space in a cupboard or drawer. Many people like portable garment steamers for travel -- and most handheld steamers travel well -- but there are a few portable garment steamers marketed specifically to travelers. 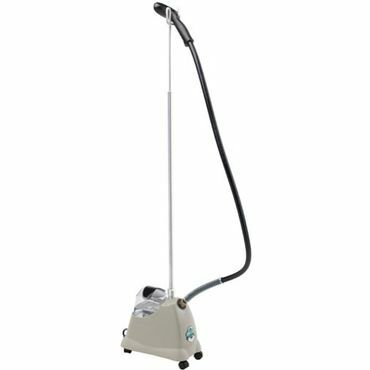 These garment steamers are especially compact, some even fold, and they often have dual voltage compatibility for international travel. They're particularly popular for business travelers and for taking along to keep the wedding party looking fresh at destination weddings. If you like the creased, crisp look of a well-ironed dress shirt or pair of trousers, a clothes steamer won't give you that. If you need (or just like) the sharp-pressed look that only an iron can deliver, see our report on steam irons. In the past, there have been no expert reviews of garment steamers, but that was not the case for this update. We found tests of a variety of different steamers at ConsumerReports.org, TheSweethome.com, YourBestDigs.com and Reviewed.com, as well as Good Housekeeping. The issue we had is that there are many types of clothes steamers, and little overlap across those three sources in the models tested, still, we did find some consensus and we took that into account. More important for our purposes are the thousands of owner reviews we evaluated for how the garment steamer works in people's homes and for their lifestyle. This real-world experience helped ups to narrow down our choices for the best steamers and handheld steamers available, including great choices for travel. We consulted thousands of owner-written reviews across sites like Amazon.com, Overstock.com, HSN.com, BedBathandBeyond.com and Walmart.com, where users share feedback on ease of use, durability, customer service issues and real-world performance.